For an organization dedicated to helping low-income households manage their electricity bills, community solar offers an opportunity to serve more people at once. In some ways, it felt like "the next logical step," according to Steve Geller, Southeastern Vermont Community Action's (SEVCA) executive director. SEVCA has worked with various partners locally to help inform energy customers about lowering their bills while offering individual programs such as weatherization. They partnered last year with the Rural Renewable Energy Alliance (RREAL), a non-profit based in Minnesota, to better understand the process of installing a solar array of nearly 110 kW direct current to reduce the bills of 50 low-income families in the area. RREAL brought technical expertise and helped the community action agency navigate the regulatory process in the state, Geller told Utility Dive. This included contacting Green Mountain Power (GMP), Vermont's sole investor-owned utility, and the Vermont Department of Public Service, "to work through all the regulations." "I don't know that we would have tried to take it on ourselves, but RREAL had a clear vision ... and really understood what it took to do something like that, and were able to guide us through that process," Geller said. RREAL already established a 217.6 kW direct current community solar program to help low-income households, launched in 2017 with the Leech Lake Band of Ojibwe's Energy Assistance program in Minnesota. "[The Vermont project] is not a one-off and it's not a first-of-its-kind," Jason Edens, RREAL's director, told Utility Dive. When complete, the Vermont solar project, dubbed Community Solar for Community Action (CS4CA), will reduce SEVCA's bills and those of approximately 50 households. The solar array will help "generate about $23,000 worth of electricity per year," according to a project description, although Geller said the benefits program is still being designed, along with the eligibility criteria. "If we wanted to scale low income community solar quickly, we could easily do that in partnership with this existing network of Energy Assistance service providers that are literally, you know, from Key West, Florida to San Diego... all across the country," Edens said. Energy bills place a financial burden on households throughout the nation. The federal Low Income Home Energy Assistance Program (LIHEAP) exists to help alleviate that burden. While the program covers the entire country, Edens, a former beneficiary of the program, estimates that LIHEAP can only cover about a fifth to a quarter of its applicants due to lack of funds. Congress decides the LIHEAP budget annually, as part of the federal appropriations project, adding uncertainty to the funding, providing "a stopgap, not a solution," Edens said. For Vermont, 1 in 5 residents require energy assistance. Based on those who qualified for LIHEAP, less than 35% received assistance in 2017, according to a program description for the Vermont CS4CA. To avoid the inherent instability for the program's funding, Edens targets the CS4CA program as a way to do the most social good for a community. Partnerships with agencies like SEVCA allow low-income solar to scale "across the country overnight," he said, as these Energy Assistance service providers are already serving those communities. SEVCA refused regulatory approval to use virtual net metering credits from the community solar array to deliver bill assistance to low-income families for about 25 years, offering more stability compared to the LIHEAP funding. "If we can start to integrate solar in the Energy Assistance Program and deploy community solar programs like this one, then the Energy Assistance service providers will have local control and will have the ability to provide energy assistance regardless of … federal funding," Edens said. SEVCA will begin looking for prospective beneficiaries by putting out a request for bids within the next couple of weeks, intending to sign people up by the end of May, Geller said. One consideration in SEVCA's case is that the beneficiaries of the program are required to have "a relative level of stability in their home," according to Geller, to ensure that subscribers to the program don't change too many times. Green Mountain Power (GMP), which serves the region where SEVCA operates as Vermont's sole investor-owned utility, will allow changes to net metering group members, or subscribers, four times a year. "We have found this works, as there aren't usually more than that many changes," Kristin Carlson, VP of policy and regulatory affairs at GMP, told Utility Dive via email. "This is part of GMP's tariff for every customer we serve." This creates an added concern for vetting qualified households in the low-income program. "Can't have too many transient subscribers… As much as possible, we are enrolling people who have a reasonable chance of being retained in the program," Geller said. The net metering credits get distributed among the members, according to Carlson. SEVCA will be a member, in order to offset its office utility costs, Geller said. Most traditional community service projects have been located on the ground, according to Edens. However, several states, especially in the crowded Northeast, face limitations with land-use when it comes to adding renewable energy capacity. "Although there is a dearth of available land in spatially-constrained states, I think there is still a wide-variety of ways community solar can be deployed. The logical next step, of course, would be to use available roof space," according to Edens. Municipal buildings, privately-held buildings and other kinds of real estate could be used to deploy community solar, he said. Community solar has the potential to grant 50 million low-to-moderate income U.S. residences access to renewable energy, according to a report issued last July by Greentech Media. SEVCA's community solar project will mount more than 80% of its solar capacity on its roof. RREAL helped the agency "work through all the regulation… about placement and how much of the panel capacity could be ground-mounted versus on the roof," Geller said. The ground-mounted portion of the array, 18.9 kW, was completed last October. 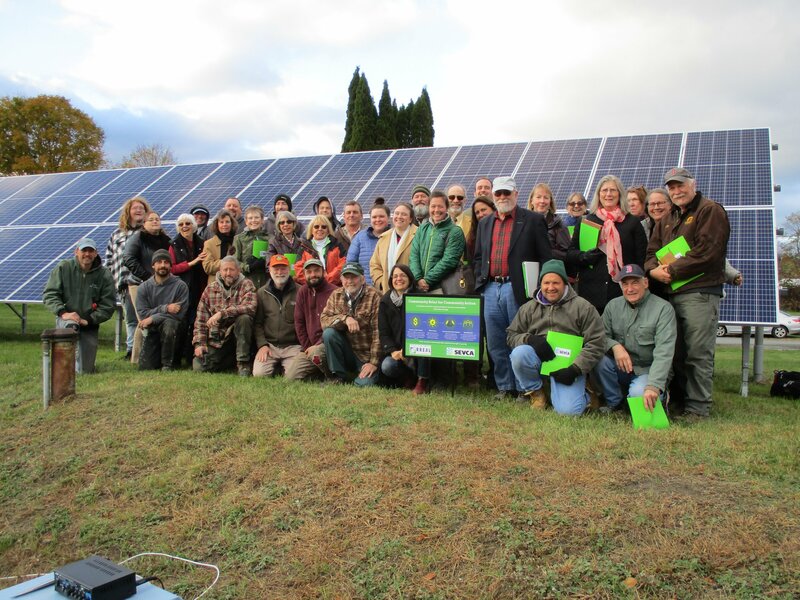 A team of stakeholders celebrating the completion of the 18.9-kW ground-mounted solar array in southeast Vermont. SEVCA is in the process of repairing its roof to support the solar array. "We are completing the roof truss repairs in-house, which we expect to be reviewed by a licensed engineer prior to proceeding with the roof-mounted array," Becky Himlin, SEVCA's director of planning and development, told Utility Dive via email.